Who was ‘spying’ on the Trump campaign? And why? Which, if true, it is! Here’s the problem: Barr provided little context or evidence for the “spying” charge. Which is kind of troubling given that he is the top law enforcement official in the country. 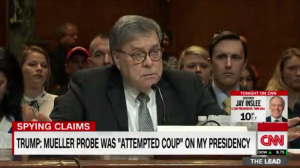 Since Barr provided almost no explanation for “spying” allegation, let’s try to figure out what he’s talking about. The best guess I can come up with begins with a man named Carter Page. Page, for a time in the Trump campaign, served as a foreign policy adviser to the presidential candidate. Page stepped away from the campaign in September 2016, after articles highlighted his Russian ties. In October 2016, the FBI applied for a warrant to surveil Page under the Foreign Intelligence Surveillance Act (FISA). The warrant was approved. And subsequently renewed three times. Based on that very simple summation, you could conclude, I suppose, that “spying did occur” on a member of Trump’s presidential campaign. But a fuller picture raises questions about that sort of over-simplification. In short: It’s neither an easy nor a partisan process. Nor is it an illegal one. Spying on an American citizen isn’t something that law enforcement is allowed to do willy-nilly but it is something they are allowed to do if the FISC judge decides they have offered sufficient evidence to prove their need to do so. The fact that Page’s FISA warrant was not only approved but re-authorized three times suggests that a FISC judge found plenty of evidence to suggest the warrant was necessary. That is, in fact, the question.